Sophistication and style are words that come easy when talking about French actress Clémence Poésy. An artist who emerged earlier this decade from the commercial success of box office hits such as Harry Potter and 127 Hours. Since then Poésy has forged her own unique career path within the worlds of fashion and film, and even turning her hand to music. In 2014, Poésy was chosen as the face of the Love Story fragrance from the fashion house Chloé, cementing her reputation as a style icon. In this candid interview, Poésy opens up her wardrobe to reveal a more provocative side to herself whilst being careful never to reveal too much. We learn about her impassioned work for women’s rights, her level-headed approach to acting and something we both very much agree on – Dustin Hoffman’s killer look in the 1973 film, Kramer vs Kramer. Going back to the start of your career, when you were 14 you got your first part in a play from your father. Is that where your bug for acting started? Not really, I guess at the time it was more of a way for me to join the adult world. I pretended to be working so that I could spend more time with my dad and feel the excitement of the lights on stage and an audience clapping at the end of a play – but I still wouldn’t call it acting. Wanting to act came from being the one clapping in the audience, watching and thinking how wonderful telling stories that way could be. You’ve said, “To embody a character, you have to lose all judgment about them. Acting makes you look at life and try to understand it in a beautiful way.” Can you elaborate on that point? Acting gives you that incredible opportunity to try and understand other people who are incredibly different to who you are. It allows you to touch, to feel, to understand a little bit of the mystery of who we are and how we relate to each other. It shakes your perception of others and allows you to see the world through someone else’s eyes, and you always learn from that. A character always teaches you something new about life. It’s a new set of feelings, fears, joys, obsessions all at your disposal and you use it alongside a group of people who are committed to telling that story. It changes the way you see the world every time. It’s a labour of love, it has to be empathy as a craft or imagination as a tool. I was doing very very small things in Harry Potter and 127 hours – even if I felt incredibly lucky to be in these films I was mostly thinking of all the work ahead of me. I’ve learned to never think that making it is actually a tangible thing. It’s a very abstract idea and your idea of it changes and evolves with you. I try to stay aware of how lucky I am to do this for a living and to meet the people and characters I meet. We know the media does a great job of misrepresenting artists. Is there a way media portrays you that you rather not agree with? It’s sad that I am not able to talk as much about the films or plays I’m in as opposed to other questions I have to answer, but I guess magazines have boxes they need to tick. That’s why I decided to go and interview people myself for publications that allowed me the freedom of a long discussion about their work, their story, their doubts – I’d much rather act on it that way – by doing my bit than be eternally grumpy about it. What three emotions do you think are integral to acting? Moving on to your inspirations, you have a great affinity for fashion. You have said, “My references, my musical tastes, everything that I like, in fact, comes from the ‘70s.” We agree, we are big fans of the 70s’. What is about that time that you love so much? I’m not sure – there’s something really pure coming out of that time – maybe a sense that the world could change through political involvement. There was a different way to look at love, a sensuality, something really warm in the music that wraps around you in such a joyful way. I love the shape of clothes in the 70’s. 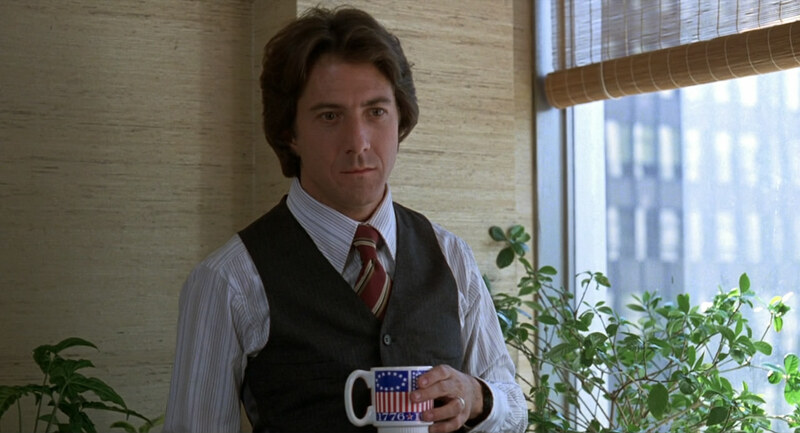 Dustin Hoffman’s look in Kramer vs Kramer is an absolute reference for me. I’m quite nostalgic for the 90’s, but in a different way because that was the decade I was growing up in. "I've learned to never think that making it is actually a tangible thing." Fashion, brands and entertainment share so much commonality right now. It seems you work very much within that nexus. You’re the face of Chloé perfume. What are your thoughts about this? I wanted to get into costume designing. Growing up fashion was always something I looked at as another way to tell stories. My sewing technique was so awful that I thought I would never make it but I wish I’d given it a little more time and effort. It’s still something I’d like to do some day and I feel that being around people who wear costumes must help in one way or another. So when I started acting and got the chance to meet designers I was thrilled to be able to start relationships with the fashion houses that I admired. Chloé was one of them and so I felt very lucky to have the possibility to work with them a little closer. I was incredibly touched that they asked me to do another campaign nine years after the first one we did together. It tells a lot about their spirit somehow, that faithfulness and sense of companionship. I am very proud to be involved in fashion when it’s done that way. It has given me the amazing freedom to choose the films I want to do, to not worry about paying my rent. It has allowed me to get involved with projects outside of my work, such as theatre, having the time to write and draw, time to set up evenings called 5X15 in Paris where people come and share their views, passions, knowledge with an audience. There are so many things I’d like to start next year! What is one thing that we perhaps don’t know about Clémence Poésy? I hope there’s more than one! It’s Sunday at 3pm, what are you usually doing? Is there an aspect of popular culture that just perplexes you that you do not understand or relate to? Social media, I bore everyone talking about how social media scares me. The need to share everything, to stage every moment of your life. The complete lack of boundaries it has created, the way it validates a cult-of-self that we would all have laughed at a decade ago. I wonder what it is going to do to our minds, how it’s going to change us as a species. I doubt it will make us better, even though when used the right way of course it is a brilliant tool it gives us a voice and a power. It’s that double thing that the internet always is– the very very best and the absolute worse. You sang backup vocals with Miles Kane on their 2008 debut release from the Last Shadow Puppets. I know you have an interest in music, can you give us a list of what you are listening to and do you ever have intentions to do something more professional in that area? Ha! You can barely hear me on that track. No, don’t worry – I have no intention whatsoever to do something more professional in that area. I’ve been listening to the last Sufjan Stevens album on repeat this year – to a lot of James Yorkston, a lot of Jon Hopkins , King Creosote of micah p. hinson. I’ve danced to Dan Deacon and Tune Yards – discovered Ezra Furman and Shilpa Ray and Her Happy Hookers – revisited Paul Simon and Nick Drake. If you could sing on stage with anyone who would you like that to be? I hear you’re a skilled illustrator as well. What kind of fulfillment do you get from illustrating that you perhaps don’t get from acting? It’s really liberating to be able to do something entirely on your own, without having to ask anybody or wait for any funds. The idea can go straight on the page and you don t have to wake up as early or stand in the cold as much as when you’re filming. You’ve said, “I’m co-writing something in the film arena—but it’s at very early stages”. Can you tell us a bit more about that? Well, until it’s done I feel a little silly talking about it, but we have tried to write a feature for a long time and this year we realised we had two short films there in our hands already that i’d like to try and get made before we finish anything else. Do you think it’s harder for independent stories to emerge in the film world and to gain visibility? How do you traverse the terrain between critical acclaim and commercial success? What do they mean to you? I don’t know, they’re not aiming for the same visibility as blockbusters anyway. France seems to allow independent films a real life and it’s a very precious thing I think. The second part of the question I’m not entirely sure how to answer, it’s always nice when the film you’re a part of gets seen and people or critics like it. Can you tell us about some French cultural curiosities that we should know of, things like films, shops etc.? Check the works of Justin Morin and Mireille Blanc. Watch anything you can find on de nos jours (Notes on The Circus) by the Ivan Mosjoukine Company. The show is not on anymore but it was magical and there are a few clips online still. Go and see any play directed by Maelle Poesy, listen to the beautiful Ava – from Ava’s Verden, watch Mustang by Deniz Gamze Erguven. Les Deux Amis by Louis Garrel. Have a look at Margot Anne Ramstein’s illustrations. Read Garçon Incassable” by Florence Seyvos and Maintenant qu il fait tout le temps nuit sur toi by Mathias Malzieu, and watch out for his new book Journal d’un vampire en pyjama. "Social media – I bore everyone talking about how social media scares me, the need to share everything – to stage every moment of your life...the way it validates a cult-of-self that we would all have laughed at a decade ago." You’ve talked a lot about women’s rights, saying, “I’m so glad my mum and my grandma have fought those battles for me but I have to keep on doing it for the daughter I may have. There are parts of the world that are still medieval.” I really like that line. Are there any causes you feel strongly about at the moment? Fighting for women’s empowerment, freedom, safety everywhere seems sadly more necessary than ever. I work very closely with a crowdfunding platform called W4 – Women World Wide web which is one of those very positive things that the internet offers, the possibility to help and contribute on so many causes at once. Acting on climate change, making enough noise for the leaders of this world to finally commit to the solutions we know exist. Keeping our eyes open, allowing migrants the opportunity to move to safety. There is so much so much to do. What terrifies you or equally enthralls you? This world. This world is both terrifying and so wonderfully enthralling. Finally, what are your plans for 2016? A few films will come out. The Ones Below in the UK , the second season of The Tunnel: Sabotage, a French film with Omar Sy called Demain tout commence. I’ve also just finished my first Italian film called 7 minuti and there’s a few things I know I’ll be doing with other people that I’m very excited about, but there’s also a few things I’d like to get going on my own, we can talk about them in a year! The Ones Below will be released on the 11th March. The Tunnel Season 2 airs on Sky Atlantic in April. All polaroids exclusively taken by Clémence Poésy. In Paris my favorite place in the world. They are daily companions somehow, such beautiful discovery tools. Any sea – at any time – under any weather.